Ombre: From pink to purple and now, blue! 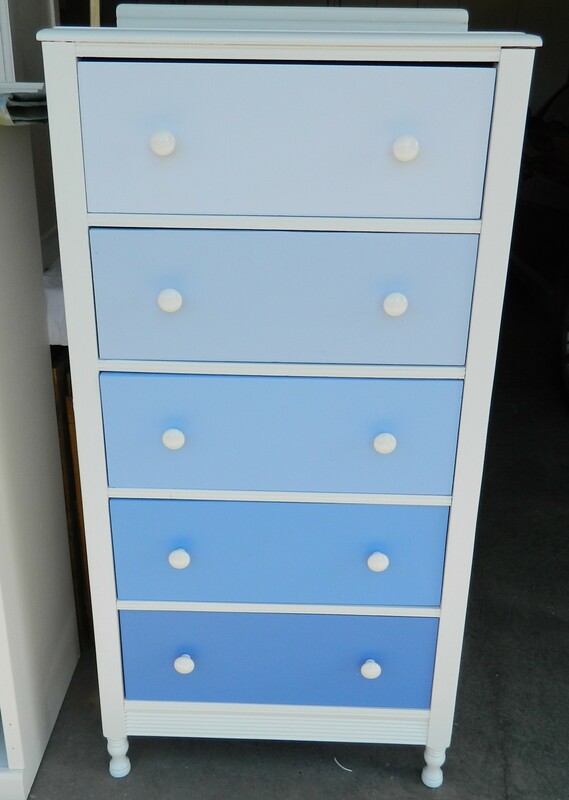 Just a quick post to show you the last dresser in the ombre series. I was leaning towards blue and this weekend, when organizing and sorting paint I found a mostly unused gallon of blue paint (left over from the downstairs bathroom), I knew the next selection would be blues! I have yet another dresser or perhaps more accurately, a short chest of drawers that I’ve picked up for the next project. Well, it is really the project after the next project. Sitting next to the dresser in the garage is the project in process, a play kitchen that I am really having fun with. It started with a free entertainment system and thus far, I have spent less than ten dollars at the Habitat for Humanity Restore for “hardware”. Everything else is either re-purposed or I already had the supplies in the garage. Oh, the things you can do with paint. Just finished my third project based on dresser upcycling and I was so excited by the end result that I couldn’t wait to write about it! 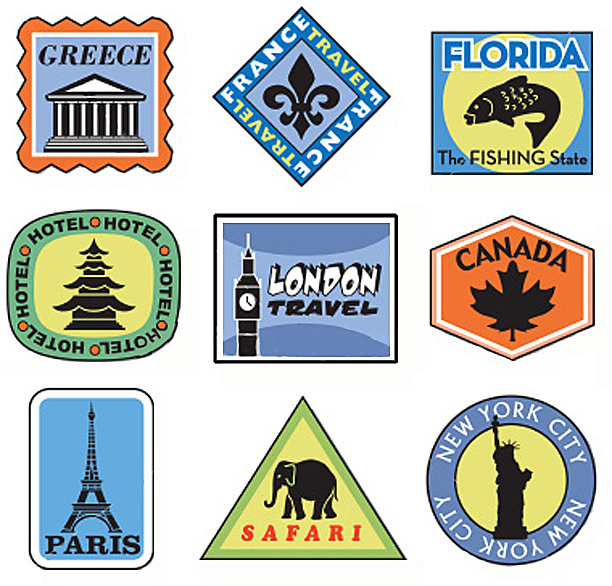 I did originally see this idea on Pinterest, showed you the photo in the last blog post. When I saw that photo, I knew I had to make one as well. This was truly a labor of love. It combines all the things I love into one thing… upcycling, painting, sewing and fabric and creativity. And it results in a beautiful yet functional piece of furniture. It has spawned a desire to redesign my guest room and take the room from a classic style to something a little more inviting and warm. I think this will be the piece that I build the room around. So, now I need to plan for the next project! 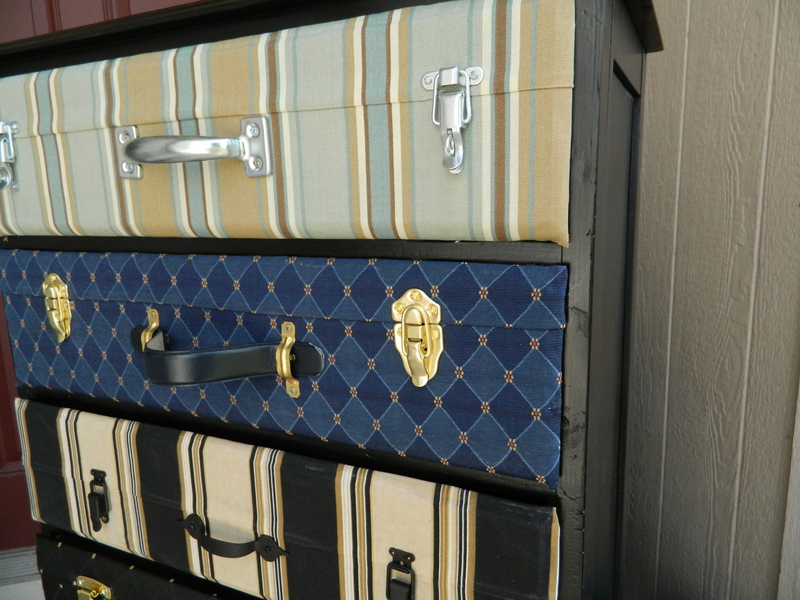 …and another dresser remake has been made and sold. This time it is lavender (or purple… I guess it depends on the shades). This one also went in a day once it was posted for sale and this time I had five people contact me about it. Unfortunately, this piece, although I love the way it turned out looking, the “bones” weren’t as nice as the first one and so I sold for less. I have learned a valuable lesson from this: never start a project with less than great quality. No matter how much effort, work, planning and care you put into it, it will never be as good as you hoped if it didn’t start out as a quality product. I love the “ombre” style that is going on right now, and think that I could like it for a while. Don’t know how long the world will embrace this fad, but I am going to do as much of it as I can while I am enjoying it. 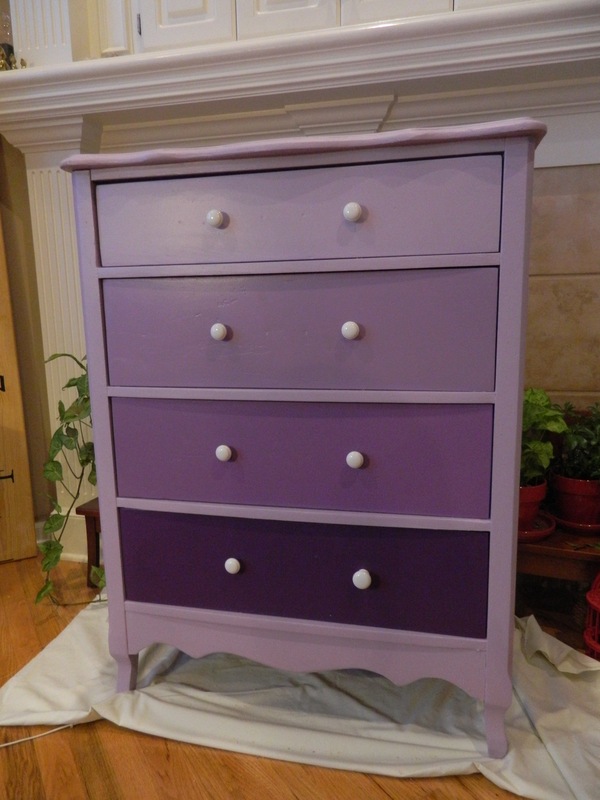 So far, I’ve done pink, this one in lavender/violet/purple. 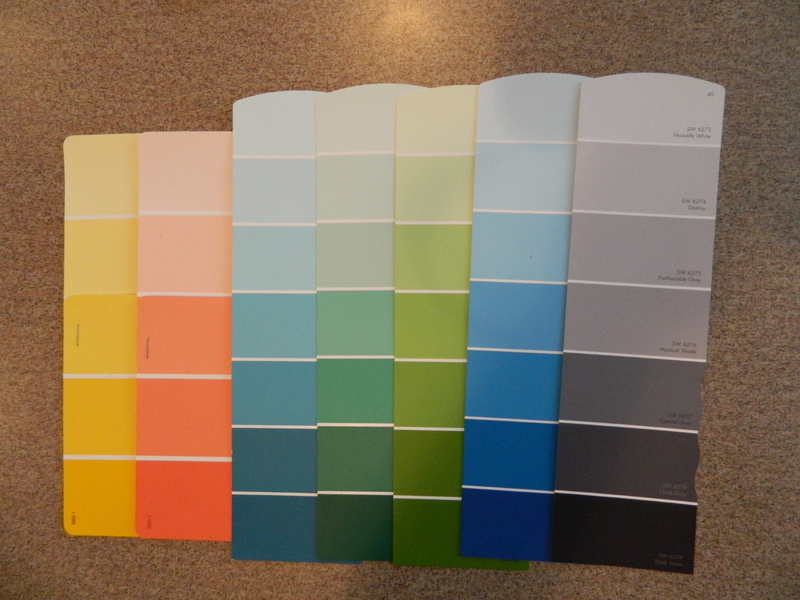 I am debating over the next one being shades of yellow, orange, turquoise or blue. I am heavily leaning towards blue, as I think that blue would sell quickly (think baby boy’s nursery) and I love blue anyway. I also thought that black might be fun… or rather, sophisticated. Or something. Ha. 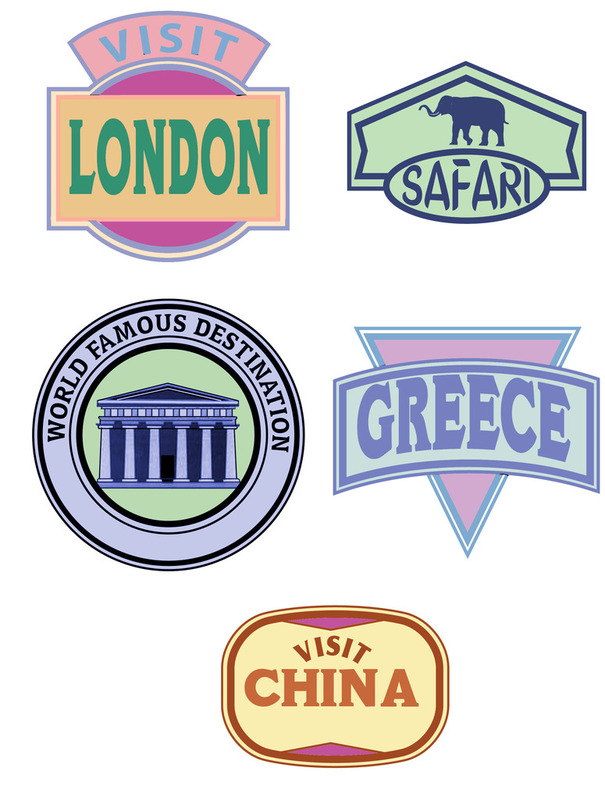 I am also working on another fun project that I am pretty sure that I am going to keep for myself. I got the idea from a Pinterest pin – I like to give credit where credit is due. 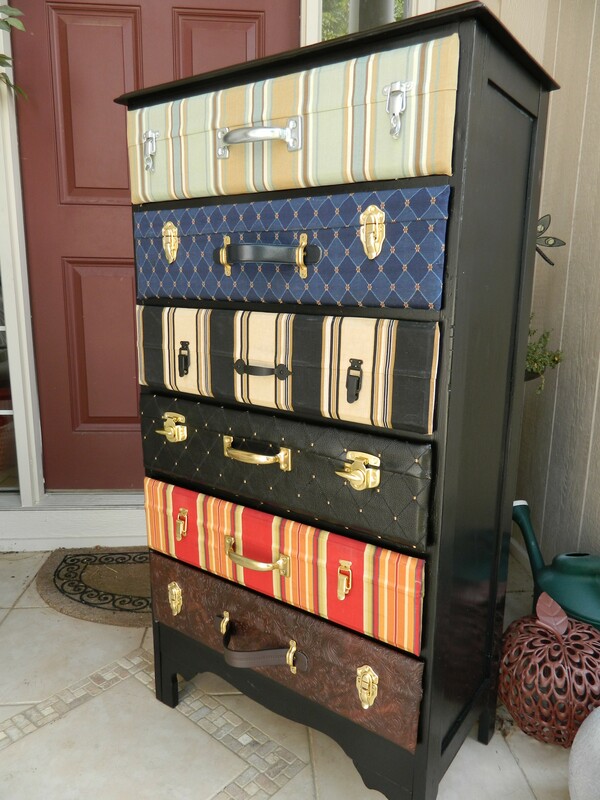 It’s a dresser made to look like a stack of suitcases and immediately piqued my interest. I knew I would have to do this next. So, I have the dresser – six drawers instead of four, so the individual “suitcases” might be thinner. But I have the fabrics and most of the hardware picked out. It is coming along nicely. I’ve also acquired a couple of round wooden tables and some chairs, looking for something awesome to do with these. One, I am sure, will become black lacquer, I’ve always wanted to do that. The other thing that has been on the back of my mind is doing something for someone else. One of the people that contacted me about the dresser was a woman who had a steady job but was making only a little above minimum wage and was hoping that we could work out something. 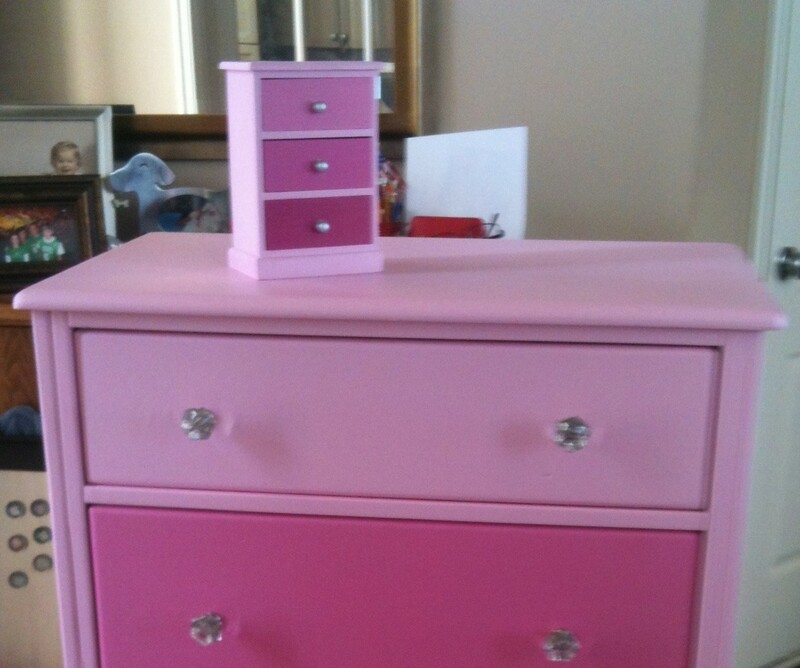 I’m keeping her name and phone number and at some point, I want to make a dresser (per her request) for her step-daughter. Paying it forward, so to speak. Anyway, thanks for stopping by and keep coming back. Expect updates on the projects. Oh and remind me to tell you about the antique sofa and side chair that I picked up. Going to try my hand at reupholstering the pieces for my master bedroom makeover. The pieces have such potential and character and the best ‘bones’ ever!